SAFETY IN THE HOUSEHOLD HAS NEVER BEEN EASIER! Is your furniture locked safe from your curious toddlers? 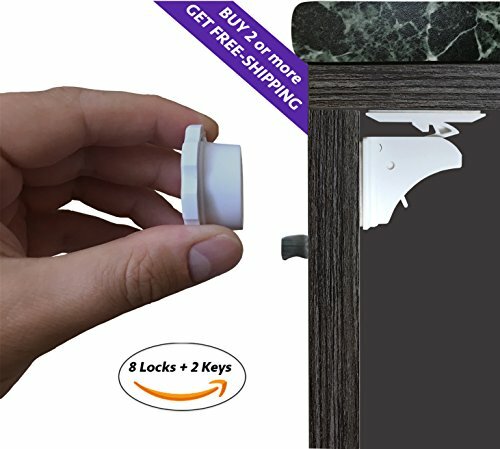 The Magnetic Lock you can use also on closet, bookcase, shoe cabinet, wardrobe etc. WHY ARE THESE LOCKS SO PERFECT? Make sure that place where you will install lock catch (latch) is flat. If isn't, our Locks are totally FLEXIBLE and are working downward, upward and on the sides of your furniture. WHAT IF MY BABY IS ABLE TO OPEN IT? Treat yourself to a moment of peace - Click "Add to Cart" and order It today! The Child Safety Magnetic Lock you can use also on closet, bookcase, shoe cabinet, wardrobe etc. This is the perfect choice for your peace of mind. ✭ INVISIBLE ON FURNITURE AND EASY TO MOVE ✭ After installation, the Safety Magnetic Lock for cabinets or drawers is completely hidden and invisible from the outside of your drawers, cabinets, cupboards or doors. The best thing is that your expensive furniture will be left with no marks or holes if you decide to remove the baby proof lock, which means that you can remove the safety lock whenever you want but you will need some force due to the strong self-adhesive tape. ✭ THIS EXCLUSIVE SET INCLUDES ✭ 8 Magnetic Locks with a BUTTON that can turn the lock "ON" or "OFF" + 2 Magnetic keys are working up to 1.4 inches + 8 lock catches (latches) + 2 key bases. Each of Locks, Latches and Key Bases have a self adhesive tape. SGS TESTED ! DOUBLE BLISTER CARD Packaging to prevent from damage and clear instruction how to install in packaging (BOOK TYPE), you'll get access to an E-BOOK and video tutorial for further assistance. ✭ 30 DAYS MONEY BACK GUARANTEE ✭ We believe that you, the customer are going to love our Safety Magnetic Lock the same as our other customers, but just in case you don't. Customer Satisfaction is our #1 priority. This is why we are offering you our 30-days money back guarantee, if our Child proof magnetic lock kit will not work correctly. If you have any questions about this product by KAMAF SAFETY, contact us by completing and submitting the form below. If you are looking for a specif part number, please include it with your message.